Arrrggghh, I don't think I've ever been this naked on my blog before! 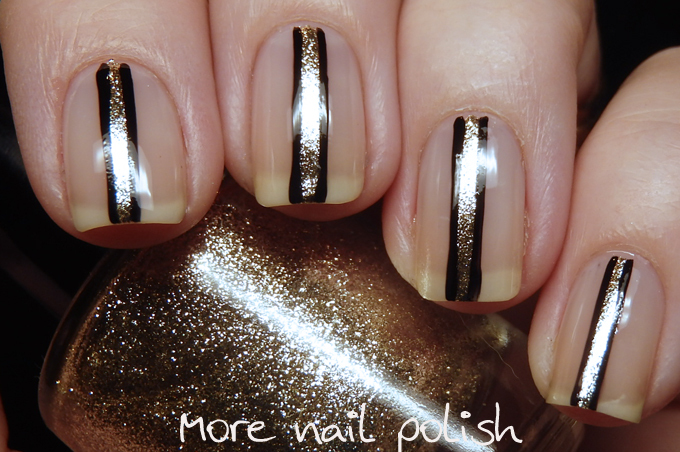 This week the Digital Dozen is doing Negative Space, and for this mani I've really taken it to the extreme. I'm so negative here that I've barely got any nail polish on, and what surprised me most was that I actually loved this look and wore it for 4 days! Because I can't go completely naked, my base polish is OPI Don't touch my tutu. I then did a single thin stripe of Lacquistry Amazeballz extra fine and then two fine black stripes on either side. Nail art doesn't get much simpler that this! I filed my nails right back here, and curved off the corners after having a few of them break off whilst I was doing some renovations to our unit in Sydney. I'm really not a fan of curved off nails on me, I don't think I'll ever go to an almond shape, let alone a stiletto shape. They have grown out a bit now, as these were about two-three weeks ago, so I'm happily back to my squared off nails at roughly the same length. Love this, I think I could wear it too! Good shade choices too! These are stunning! If my nails weren't super stained I would definitely try these out! Very creative. I love this!!! I feel like I saw something similar being used by some fashion designer recently - but just a single stripe, not outlined. I've no idea where though; I don't really follow fashion so someone must have shared it on Facebook or something. It looks really cool though!